Millions of songs start off with a totally different working title from where they end up and 99% of the time it’s the writer or members of the group who change the title usually by mutual agreement, but when Acker Bilk wrote his most successful international hit, the title was changed for him and he had to decide whether to go with it or not. Acker, who was born Bernard Stanley Bilk, was raised in Somerset, and decided on the nickname Acker after learning that it was a local expression meaning friend. His parents encouraged him musically and urged him to learn the piano but he preferred to be outside playing football or even fishing rather than practising scales. He lost three teeth in a school punch-up and half a finger in a sledging accident, which he always maintained were the reasons for his distinctive style. After leaving school he worked in the Wills Tobacco factory in Bristol, earning £1 4s a week and also dabbled in a bit of boxing. But that all changed when he was 18. This is when he decided to return to music and took up the clarinet while in the Royal Engineers during his National Service. His first clarinet was given to him by a friend but it had no reed so Acker used a makeshift one. He was posted to Egypt and found himself with plenty of spare time in the desert and borrowed a marching clarinet. He got completely hooked and when he was demobbed he ‘borrowed’ the clarinet and smuggled it back to his home village of Pensford and formed a band, playing dances. In the mid-forties he married Jean who he’d known since they were both in primary school together and decided to head to London where he became clarinettist with the Ken Colyer Band. They had two children Jenny and Pete and lived in a factory attic with the band picking up the odd regional TV appearance but his big break came with a six-week stint in a Dusseldorf beer bar. In 1957 he formed his own Paramount Jazz Band and decided to attire in bowler hats and waistcoats to distinguish them out from the other bands of the day. Their first single was Dippermouth Blues, a song first recorded by King Oliver’s Creole Jazz Band in 1923. The following year they recorded their first album which sold out its small run of 500 within a couple of days, with more being pressed to meet demand. In 1959 he released six EPs some of which Acker was heard singing. During the recording of their second album, Sentimental Journey, they found they were a couple of tunes short and that’s when he started writing his own music. The first one he wrote was a song called Jenny after his daughter which he later claimed he wrote in the back of a taxi. In 1961 the BBC approached Acker and asked him if he would like to write a theme to a new up and coming children’s show. He agreed and played them his first composition Jenny. The BBC liked it but obviously wanted to change the title to fit the name of the programme which was called Stranger on the Shore. Not really happy about it, but he agreed and the show went ahead and was about a French Au Pair girl living in England – she was the Stranger on the Shore. The closing credits were over film of her standing on the beach looking out to sea, towards France. Following its airing the demand was immense for the programme’s theme and his label pressed it as a single and within a couple of weeks it climbed the chart. It reached number two on the ‘official’ UK chart although many other, probably more accurate charts of the day, had it at number one. It did, however, spend 55 consecutive weeks on the singles chart which was recognised as a record breaker for a song that didn’t reach the top. In 1967, Engelbert Humperdinck’s Release Me did 56 straight weeks but that did reach number one. Those records have been broken but only in recent times. Four number one songs have done more, which were Onerepublic’s Counting Stars with 59 weeks, Adele’s Someone Like You with 61 weeks, The Black Eyed Peas’ I Gotta Feeling which did 65 weeks and the record-holder; Pharrell Williams, whose hit Happy has registered 70 consecutive weeks. The award now for longest straight run for a non-chart topper goes to Idina Menzel’s amazing run of Let It Go, from the film Frozen which did 63 weeks and amazingly only reached number 11. 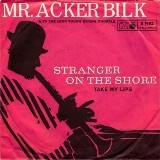 Stranger on the Shore went to number one in the USA and in doing so Acker was recognised as the first British artist, in the rock era, to top the Billboard singles chart. The closest any UK artist had come up to that point was Lonnie Donegan, who reached number five earlier in 1961 with Does Your Chewing Gum Lose Its Flavour (On The Bedpost Over Night). It didn’t give Acker a lasting career in the States, but in the UK he had further hits which included Frankie and Johnny, Lonely, A Taste of Honey and his 1976 comeback single Aria which restored him to the top 10. In 1962 a vocal version of the song, with a lyric written by Robert Mellin, who had co-written the 1952 song My One and Only Love, describes the stranger as heartbroken and wishing his love will return. The Drifters recorded it but the only UK hit was for Andy Williams who reached number 30. In 1969 the crew aboard the Apollo 10 mission to the moon took with them a cassette copy of Stranger on the Shore and in 1982, Squeeze paid homage to the tune on their album Sweets from a Stranger with a track called Stranger than the Stranger on the Shore. Even after the onslaught of the Beatles he remained a staple of the TV variety circuit along with contemporaries Kenny Ball and Chris Barber, whose many TV appearances made them familiar to subsequent generations. He suffered a heart attack at the age of 47 which made him modify his lifestyle, persuading him to give up smoking, but he fought back and continued to perform. In October 1999 he noticed his voice had become hoarse and he suspected growths in the throat, but after seeking medical advice he was told it was throat cancer and he underwent six weeks of radiotherapy treatment which resulted in a number of shows being played by the band without him. However, he survived and, against all the odds, returned to playing his clarinet on stage. Bilk was awarded the MBE in the New Year Honours List of 2001. In 2000 he was diagnosed again with throat cancer which was treated successfully. He also had eight operations for bladder cancer and suffered a minor stroke.